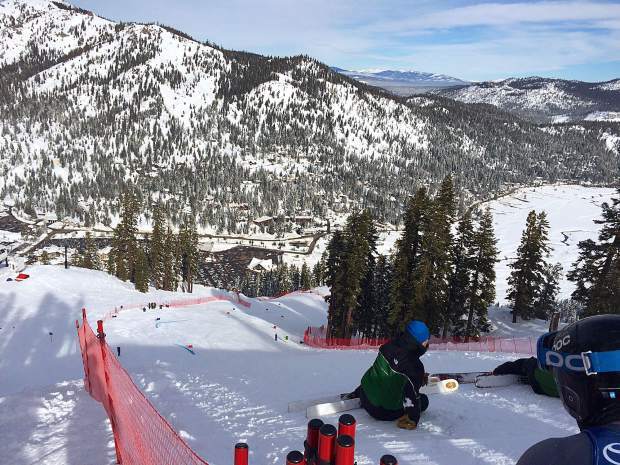 A view of an FIS course on Red Dog from the top of the mountain at Squaw Valley. • Visit www.squawalpine.com/worldcup for a complete list of 2017 World Cup weekend events. • Also, aside from the World Cup races themselves, fireworks, a parade and big-name music are among many other planned events this weekend. • Parking and transit figure to be a challenge to maintain for this weekend’s event, but there are options to consider. OLYMPIC VALLEY, Calif. — When it comes to skiing at Lake Tahoe, there are the powder hounds and there are the racers, and both like very different snow conditions. While the powder hounds are basking in all of this fresh snow — leisurely going through the trees and jumping off the KT-22 cliffs — the World Cup women ski racers just want a hard, fast and consistent surface. Watching an FIS race on Red Dog back in mid-January, racers jetting down the mountain at mach speed would hit a bumpy patch and go careening off the course. One person got caught up in the fencing and disqualified, and luckily walked away from it. Another racer ejected out of his skis, and fellow racers took off down the mountain, leaving him behind. It’s definitely exciting to watch. When one’s whole career is in ski racing, it’s easy to understand the need for a perfect course and good weather. Squaw Valley’s cat groomers have been working doubles, switching off on the 5 p.m. to 4 a.m. and 5 a.m. to 8 a.m. shifts to till the track and remove snow, while relying on cold temperatures and cloudy/sunny skies to hold throughout the weekend. “Red Dog is one of the most challenging courses on the ladies’ tour this year, and it’s taking a lot of time and skill to reshape the snow that has been groomed, moved and skied on so much this winter — we have a 21-foot base right now,” says Squaw Alpine Public Relations Director Liesl Kenney. USSA Snow Surfaces Director Trevor Wagner says that prepping the course has been going well, but it’s a lot of work. Last weekend’s storm put them behind a little bit, but now with a break in the weather, the team has been able to remove snow off the course, and on March 7, crews started watering it down to create a slick surface. “In the first prep, we peeled off 2-3 feet of snow with the cat and blade and removed another two feet of snow in certain spots,” says Wagner. About two weeks before the event, Squaw Valley groomers built up the natural features that make the course unique and then “track pack” it, which means that the snow is groomed out without the tiller (which is the corduroy you see when skiing). With just the groomer tracks hitting the surface, it’s rough in texture, and snow piled on top of it needs to be removed. Now that there is a clear window in the weather to set up the course, Wagner and his team will start to install the fencing and timing equipment. The start and finish areas are set up and the course itself gets “set” — a designated coach from one of the competing countries drills in the gates using a laser range finder (to maintain a specific distance between gates and the “offset” — aka, how big the turn is). After the timing equipment is in place, terrain changes are highlighted in paint to direct the racers in poor visibility or flat light conditions. Working at least 12-hour days himself since the last big Feb. 16-17 storm, Wagner says that the course then stays pristine until the races — it isn’t tested at all and race teams just adapt to the density of the snow the day of. When asked if he’s happy that the weather cleared up, Wagner replies, “Oh yeah, if it can hold through the weekend then we’ll be good. The biggest thing is we’re very grateful for the support from Squaw Valley and all of the resources they’ve provided — they’ve supplied anything I’ve ever asked for to make this event a success. Kayla Anderson is an Incline Village-based freelance writer. Email her at kaylaanderson1080@gmail.com.